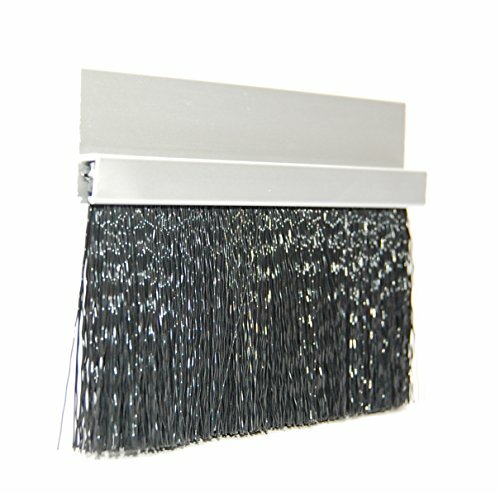 JaCor Medium-Duty Brush Seal; Clear Aluminum Straight Holder, Black Polypropylene Brush; 3.0'' Brush x 1.0'' Holder (180deg) x 96'' Long by JaCor, Inc at In The National Interest. MPN: D480CLA30PC-96. Hurry! Limited time offer. Offer valid only while supplies last. ProSeal: Our medium-duty, durable, and high-quality Polypropylene or ''poly-pro'' filament is good for wet or dry applications with lower duty cycles. ProSeal: Our medium-duty, durable, and high-quality Polypropylene or "poly-pro" filament is good for wet or dry applications with lower duty cycles. Polypropylene has excellent stiffness when wet and good abrasion resistance and bend recovery. ProSeal Size brush comes in crimped polypropylene filament with filament lengths from 1.5" to 4" long and with various holder configurations and lengths to fit your application. This 3" Brush comes with a 96" Lg Straight aluminum holder and self-drilling/self tapping fasteners to complete the installation. View More In Brush Seals. If you have any questions about this product by JaCor, Inc, contact us by completing and submitting the form below. If you are looking for a specif part number, please include it with your message.